All aboard for Dreamland! Hold on to your pillow because the Goodnight Train is taking off. Roll that corner, rock that curve, and soar past mermaids, leaping sheep and even ice-cream clouds. With soothing words and magical illustrations, the most resistant sleeper will want to snuggle up tight. A lovely picture book rich with color, rhyme and sound words, this one will be a hit for parents and kids as a bedtime read. The Goodnight Train rolls through the countryside, counting down to bedtime, encountering dreamlike characters and images along the way. The rhythms gently slow down as the train reaches the station lulling little ones to sleep. Parents everywhere will be thrilled to have a fun, fresh alternative to reading the classic Goodnight Moon, yet again. 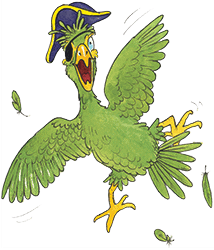 PreSchool-K – This bedtime story is likely to strike a chord with young listeners. A gentle, rhyming text intersperses train noises with a getting-ready-for-bed routine with a railroad-inspired theme. Brightly colored cartoon illustrations picture children in their beds being pulled along by the engine. They ride through tunnels, over bridges, and past fields of sheep. The words flow fairly well, with only a few minor skips, and the sounds mixed with bedtime sounds (Rock-a, rock-a, rock-a, rock-a–Shhhhhhhhhhh! Shhhhhhhhhhh!) will delight youngsters and have them chiming in. The acrylic-and-collage artwork curves around the spreads and encourages page turns. 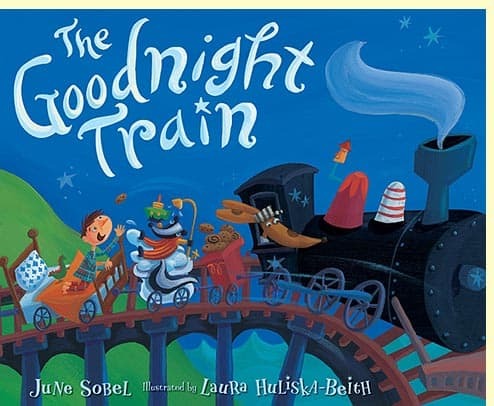 Clever backgrounds, including a sign that declares, Dreamland 20 winks ahead, ensure that there is plenty to look at, and the journey ends effectively with the children asleep and the words, Good night, train./Good night. Libraries in need of more train or bedtime books will find this a useful and enjoyable addition. Below is a printable coloring sheet from The Goodnight Train by illustrator Laura Huliska-Beith. Click on the image to download the PDF.